A client may be un-enrolled for a number of reasons. There are two categories of un-enrollment: false enrolls and withdrawals. See Section Five of your Alberta PCAP Manual for more information. In Penelope, you can indicate if a client is un-enrolled from the program using a form specific to Penelope called “Un-enrollment from PCAP”. 1. Find the client’s PCAP service file page through “My Caseload” or by doing a search for the client and accessing their PCAP service file page. Make sure the top corner says “PCAP”. 2. Find “Documents” on the menu on the right side of the PCAP service file page. Select “Un-enrollment from PCAP” from the drop-down menu. 3. Enter the document date and select the client’s name in “For Service Participant”. Click anywhere off of the text bar to load the rest of the document. 4. Answer the document questions. Date of un-enrollment may be backdated. Reasons for un-enrollment include false enrolls and other withdrawal reasons. Select “Other” if you cannot find your client’s un-enrollment reason. Enter the reason in the text-box that appears beside the drop-down menu. Date of last contact is an optional, but useful field if you know the date. Provide more details in the “Comments” section. 5. Click “next” to the Signatures page. 6. Sign the appropriate signature lines using the following instructions. NOTE: Only the PCAP Supervisor should “sign” the second line. The PCAP supervisor must access the form from their account. b. If you are the PCAP Supervisor completing the form, select BOTH check-boxes to fill your name in both signature lines. Enter the dates. ii. Go to client’s Case page and/or click the PCAP service file. iii. Under “Documents” (on the right-hand side of the page), click the blue link that reads “Un-enrollment from PCAP”. iv. Click the “edit” button at the top of the page. A box should appear to edit the document. v. Look through the information to ensure it is correct. Make changes as necessary. Click “next”. vi. Find the signature line that says “PCAP Supervisor”. Click the check-box above it. Your name should appear on the signature line. Enter the date. vii. If you are certain that all information is correct, select the box that says “Lock revision”. (If you select “Lock revision”, the document cannot be modified in the future). This entry was posted in General and tagged false enroll, signature, un-enroll, withdraw on October 22, 2013 by kbonot. What is a PCAP ID? The first 3 numbers is your site number (provided by the system administrator). The last 3 numbers identify the client (provided by your PCAP Supervisor). When entering a new client in Penelope, enter the first three digits of the PCAP ID into the “First Name” field (ie. site number). Then, enter the last three digits into the “Last Name” filed (ie. client number). This way, when the client’s case is created, they can be identified by their client number. Jane’s case is then called 789 Case. You can change the name of the case so that it shows the WHOLE client number. Go to the case page, click “Edit” to change the case name. We strongly encourage programs to adopt this numbering system for confidentiality and consistency. If you would like help with changing your existing clients to a numbering system, contact the Quality Analyst. This entry was posted in General and tagged pcap id on October 15, 2013 by kbonot. 1. Locate the document you want to print, whether it be biannual, or ASI. 2. Click the blue link of the document you want to print. You will be taken to the document summary page. 3. From the document summary page, locate and click the “Print” button. It is on the right hand side of the page, underneath the question mark (“help”) icon. A new window should pop-up with a printable version of your document. 4. From the printable version of your document, either a) click the PCAP logo on the left hand corner of the pop-up window, or b) press “Ctrl” + “P” on your keyboard. This will bring up the print dialogue box, where you can change your print options and print. This entry was posted in General on September 29, 2013 by kbonot. Alerts are set up to remind you whenever a client’s service file ages approximately 6 months (182 days). The 182 days is based on the service file start date. Both the primary worker, and the site supervisor will receive the alert. The alert will appear on your home page under “My Tasks”. To clear the individual task/alert, you can click “delete” in the top right-hand navigation bar. If you have many clients, sometimes there will be more alerts than initially visible on your home page. Click “more” (underneath “My Tasks”) to see more alerts. You can also delete all the alerts at once, when you are done with them. 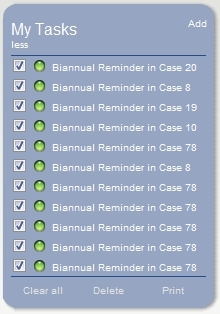 Click “select all” at the bottom of the “My Tasks” menu, so that a check-mark appears in all the boxes. Then click “Delete”. You can print a summary of your alerts by clicking “Print” at the bottom of the “My Tasks” box. A separate window will appear with a printable version of the list. Hit “Ctrl” + “p” on your keyboard to print the window. This entry was posted in General and tagged alerts, tasks, to-do on August 27, 2013 by kbonot.